Make this Low-Carb Mushroom, Green Pepper, and Feta Breakfast Casserole on the weekend and eat it all week! And this tasty breakfast casserole is also meatless, gluten-free, and South Beach Diet Phase One. Click here to PIN Low-Carb Mushroom, Green Pepper, and Feta Breakfast Casserole! It’s been more than ten years now since I started on my personal journey of carb-conscious eating, and if I had to pick one thing that’s helped me to stick with lower-carb eating, it would be low-carb recipes that can be made on the weekend and then reheated during the week. And there’s no doubt that topping that Low-Carb Breakfast Casseroles would top my list of things to make every weekend. Just taking a few minutes to get a breakfast casserole like this into the oven gives me an easy breakfast that just takes a few minutes to reheat, and gets my week off to a good start. This Low-Carb Mushroom, Green Pepper, and Feta Breakfast Casserole is something I first made back in 2007, and this combination for a meatless breakfast casserole is still one of my favorites. When I first made this recipe I liked using 18 eggs to a breakfast casserole like this, but now I prefer more veggies and cheese and a little less egg. Breakfast casseroles are a great way to use leftover vegetables, so if you have anything in the fridge that might go well with mushrooms, bell peppers and feta, go ahead and throw it in! And if you’re a fan of eggs for breakfast, don’t miss Ten More Delicious Meatless Recipes with Eggs after the recipe. Before you make this you may want to read Basic Instructions for Low-Carb Breakfast Casseroles which has instructions for different sizes of pans and ingredient options for this type of breakfast casserole, as well as 15+ of my favorite low-carb breakfast casserole recipes. I always feel a little more virtuous when I start the day with a healthy breakfast with lots of veggies, and making this on the weekend gets my week started off on the right track! (There are lots more Vegetarian Recipes in the recipe index. I also have a very active Meatless Monday Pinterest board with ideas from blogging friends. One at a time, saute bell peppers and mushrooms and layer the veggies in a casserole dish that you’ve sprayed with olive oil or non-stick spray. (I used a dish that was 10″ x 14″ but anything close to that size will work. Crumble the Feta cheese over the vegetables, then beat the eggs with Spike Seasoning and black pepper and pour over the vegetable-cheese mixture. Sprinkle with green onions if using. I give it a little stir with a fork to get the veggies evently distributed in the eggs. Bake in a preheated over at 375F/190C for 35-45 minutes, or until the eggs are set and the top is starting to lightly brown. Serve hot. I love this with a dollop of sour cream. Make this Low-Carb Mushroom, Green Pepper, and Feta Breakfast Casserole on the weekend and eat it all week! 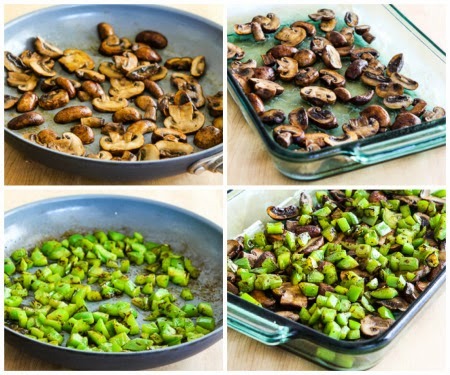 Wash mushrooms if needed and cut into thick slices. Cut out stem part of the green pepper and chop into pieces about 3/4 inch square. Heat non-stick frying pan to medium high, add small amount of olive oil, and saute mushrooms 4-5 minutes, until softened and starting to brown. Spread mushrooms in bottom of casserole dish. Add a bit more olive oil to frying pan if needed, and saute chopped green peppers until softened and partly cooked. Layer peppers over mushrooms. Crumble feta cheese over top of mushroom-pepper mixture. Season with Spike Seasoning and black pepper. (Don’t add salt because Feta cheese is salty enough.) Sprinkle with sliced green onions if using. Beat the eggs until yolks and whites are well-combined and pour over mushrooms, peppers, and feta. Use a fork to gently stir the mixture so veggies and cheese are well-distributed in the eggs. Bake 35-45 minutes, or until casserole is firmly set and top is slightly browned. Serve hot. I like to eat it with a dollop of sour cream on top. Breakfast casseroles like this can be stored in the fridge for at least a week and reheat very well in the microwave or in a pan on top of the stove. (I used to freeze them but I no longer recommend that because the eggs break down and release liquid when they’ve been frozen.) If you’re heating in a microwave, be careful not to heat too long or the eggs will get rubbery. 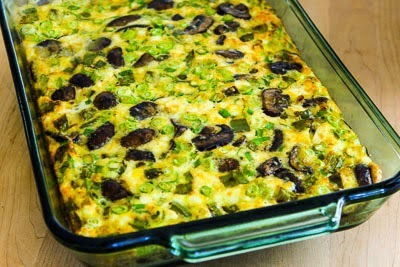 This Low-Carb Mushroom, Green Pepper, and Feta Breakfast Casserole is a perfect breakfast for any phase of the South Beach Diet or any type of low-carb or low-glycemic eating plan. Thanks Linda, glad you like it. And I'm afraid comment moderation is something I can't avoid. Seems like if I open comments up, I get over-run with spam comments. I love that this is so much veggie! This is my idea of the perfect breakfast make it ahead! I know I’ll be doing this one. And it look so easy to be putting it together. Mrs. L., you can use any type of cheese. Also there are other options in the recipe archives with different cheese. One of my favorites is broccoli with cheddar cheese. Though I love feta, the husband doesn’t. I could probably substitute other cheese in this? And maybe add some salt? I like the sound of a breakfast casserole and this one looks tasty. Jenni, it really does stay good for quite a long time. I ate some of this one today and I made it 8 days ago. It was just fine. You can freeze it too, but I do think it’s better when it hasn’t been frozen. How long will it stay fresh in the refrigerator? I’m the only egg eater in the family! Thanks for all your yummy recipes! Dina, thanks. Hope you like it. Mrs. G., yes I think you could eat this for breakfast, lunch, or dinner. I can imagine that green peppers would be hard to sneak past a kid. Try some other vegetable combination. Broccoli/cheese is good in this. I don’t think I can manage some kind of vegetable project with the class because I just switched to third grade this year and I’m barely keeping my head above water with the blog and a new curriculum. Plus I don’t teach health, there is a special teacher, so it would be hard to fit it into the day. Thanks for thinking of me though. 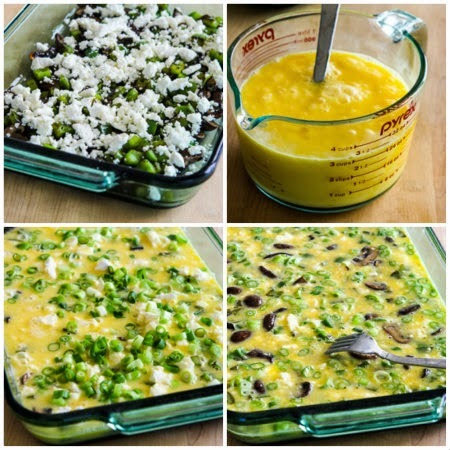 Kalyn – This is the first time I have read of a breakfast casserole and I wll try this with the kids. I might substitute the peppers aas Freddie finds them a little off-putting! Fancy doing some kind of veggie-recipe hook up with your third grade kids and one boy in London? I’m going to make this for breakfast this week. Really great idea. Susan, this should be perfect for you. Just throw in whatever veggies are in growing at that time, chard, spinach, zucchini, peppers, just about any vegetable would be good. Chigiy, I had about given up on peppers before this year, but now I’m sure I will grow them every year. I just hope my pepper curse doesn’t come back! Nabeela, thanks. Hope you like it. I’ve been searching for a veggie-heavy breakfast casserole for days. I wanted a tried and tested recipe….and this seems perfect. I’ll probably try it with red peppers..I agree with you about them being milder nand tastier. Thanks for the recipe! Next year I’m going to grow my own green peppers, because I agree. I am not a big fan of store bought peppers, but home grown are yuuummmmy. Lucette, isn’t that interesting that we both had the pepper curse? And this year my peppers have been gorgeous! ETB, good for you! This is a great “before school” breakfast. It will keep you going until your (very short) lunch break! Hooray, this anonymous comment is from my friend Robin who has just gotten her internet connection hooked up. I see she knows how to get in touch with me! Guess what! I’m emailing from my home laptop that I just hooked up myself (while on the phone for 45 min. with a very nice Canadian woman). It looks excellent and seems to be a great time-saving idea for busy people. I shall have to try it! I will be teaching myself before too long, so ideas like this will come in handy! This looks good enough for company! I had my 1st successful year with green peppers this year, too–trying to figure out why. Valli, we were writing our comments at the same time! I agree, Feta is wonderful in everything you could possibly imagine! Anh, me too. Love the combination. EMWK, thanks. You can make any variation that appeals to you. Ed, I think turkey would taste great in this. Sher, I never buy them in the store, but love the garden ones. Jasmine, there are no class size limits in Utah. Too many students to be able to afford that. But luckily most of the kids are pretty well-behaved and I have a lot of parent volunteers and an aide. Hope you like the breakfast casserole. Anything with feta has to be good!!!! yum!! I was checking my blog lines last night while waiting for my boyfriend to get off the phone and came across this recipe and while this mornings breakfast was reheated spinich and tomato frittata from yesterday before he had to run off to church — I am making this when I get back from the farmer’s market for breakfasts this week! Sorry to hear about the 28 kids — we just added a new kindergarten because all the classes were up to 24 and more were coming every day…I think our cap in 3rd grade is 26 before they add new classes. I love breakfast casseroles. They’re delicious and easy to assemble. And I can’t figure out why store bought bell peppers are often rather bitter. But, home grown oners don’t have that problem. Kalyn – You had me at “Breakfast Casserole”. That looks delicious. I can also imagine tossing in some shredded leftover turkey for yummy day-after-Thanksgiving turkey breakfast. I love this dish! Beautiful presentation. This is a great idea for extending meals into the week. I’ll have to keep this one in mind! This is a very nice dish for brunch Kalyn! Mushrooms and feta, one of my fav combo! Nika, glad to hear you are getting peppers. Your garden is so impressive. I want grow boxes! Rob, I have heard a little about square foot gardening, but don’t know much about it. thanks for the tip, I will check it out. Is this guy from Utah? I didn’t know that if he is. Messo, I agree, cook once and eat a few times. Thanks! Lydia, this is totally flexible, you can add just about anything. Well, maybe not fish! Katie, I confess, I do sometimes eat it in the car! But I try hard to eat at home. Pille, me too. We’re fellow Feta lovers! Janelle, I bet the farmers market peppers are also great. I do have an awfully cute class this year. There are just too many of them (28). But I’m doing ok and they seem to think I’m at least mildly amusing! Hope you are well! And that you have a nice 3rd grade class this year. :) They are lucky to have you. You actually eat this for breakfast? I mean, I would love this for breakfast, but when I was working my breakfast was a muffin and a handful of dried fruit eaten in the car. I could have it now, though…naw, I’d have it for lunch with a glass of rosado! Anyway, it looks and sounds scrumptious! I love recipes like this, too. So flexible, so easy to make, so impressive when you serve them to friends. This is great…I also love dishes I can eat from for a few days…I can have homemade food but also save time! This is looking delicious!!! I have never come across the concept of a breakfast casserole before but I am sold! So practical to do the big cooking at the weekend and have portions to use in the week. Kalyn, as you are in Utah, I was wondering if you have heard of Mel Bartholomew and his concept of Square Foot Gardening? As an avid gardener it might be worth you getting his book or checking out his website (www.squarefootgardening.com/). I believe he also runs courses locally. This looks so delicious, will have to give it a try! We FINALLY got a few green peppers too, we had the same problem you had.